Settled in 1639, Guilford still has one of its original stone houses...and you can visit it. Guilford, Connecticut was founded in the summer of 1639 after a group of Puritans arrived in the colony of Quinnipiac (now New Haven) from England. Under the leadership of Rev. Henry Whitfield, they negotiated with Shaumpishuh, sachem of the local people, for use of a tract of land east of Quinnipiac and west of another colony, Saybrook. The name of the place was Menuncatuck, which later became Guilford. The land was a short distance inland from the waters of Long Island Sound, across the broad band of salt marsh that guards the coast here. The Guilford colonists built modest log houses with thatched roofs for themselves, but a fine stone house for Rev. Whitfield. The Whitfield house, finished in the year of their arrival, is the oldest house in Connecticut and the oldest stone house in New England. It's preserved and open to the public as the Henry Whitfield State Museum. The Guilford colony prospered, with rich fields and orchards supplemented by food and income from the sea. The modest thatched homes around the town green were replaced by fine colonial, and then Federal and later style houses. The 19th century saw increases in industry, including shipbuilding, carriage-making, iron foundries, granite quarries, and canning of food. The coming of the railroad gave another boost to Guilford's economy, and the line linking New Haven and New York City with New London, Providence and Boston still goes right by the center of Guilford. Victorian families would escape the big cities and come to Guilford for summer vacations in its natural beauty and serene atmosphere. In the 20th century, the construction of the Connecticut Turnpike (now Interstate 95) brought Guilford into even closer contact with other Connecticut shoreline towns. Guilford has now settled down to a dignified life as one of the prettiest and most dignified towns along the shoreline, attracting weekened, seasonal and even permanent residents from as far away as New York City. 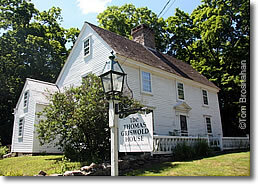 Thomas Griswold House, Guilford CT.